Paper Choice. Basic options are Matte, Gloss, Linen or Cotton. Paper says a great deal about your style & gravitas. Plus, thicker stock will hold the ink better. Make your card count. Don’t go below 14pt/100 pound weight. Use a thick stock. Some local printers cannot print over 120 pounds, which should be adequate. Matte: A classic finish, with a smooth look. If you are planning to use fancy options like spot UV, it will be on matte. Gloss: Everyone who developed pictures on film remembers the matte or gloss question. Gloss can vary in intensity. I prefer more of a waxy sheen to directly reflective. Most mid range & local printers offer a subtler effect. I would steer clear of “free” or ultra low cost online printers. Linen: Textured with symmetrical lines, this is the classic & classy card. It’s elegant, classic & vaguely retro in that Mad Men, stylized way. Cotton: Linen is made of cotton stock. The primary difference is texture. Cotton is smooth, having the option to offer frayed edges for more artistic of businesses. Alternatives to Paper: Plastic, Frosty or PVC (yes, that stuff your sprinkler lines are made of). If you’re a lover all things high tech, this class of cards was meant for you. Available as transparent or “frosty,” plastic cards look sleek. Yes, it’s more costly but it will tickle the fancy of early adopters. I would not recommend this if you are shooting for an ecologically friendly business image. The next tier of plastic cards are PVC. They are very thick, closer to a credit card than a business card. Expensive but hefty, these cards will match your Porsche perfectly. There are a host of other options using black paper or metallic papers. They warrant investigation but I would highly recommend ordering a proof to physically see the look of the card before ordering. Local printers have skilled & seasoned designers capable of redesign, improvements & with many helpful suggestions. It may seem like more money up front but it’s worth it. 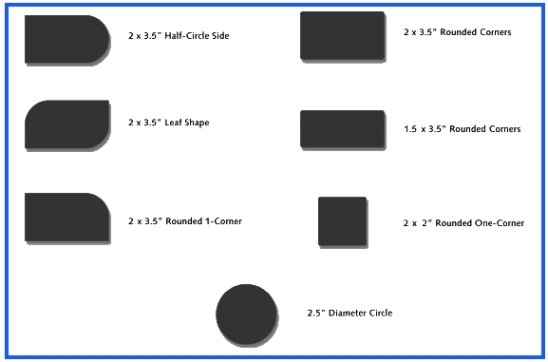 Size & Shape: Tiny square to standard rectangles, die cuts & the unconventional. Personally, I just don’t like getting a 1″ x 2″ super thick rectangle card. It is awkward, tends to slide around or get lost & it just isn’t very professional. Standard sizes help me to organize your card & keep it handy, which after all is the entire point of a business card. If you’re opting for an unconventional card to express your unique attributes or minimalism go with die cut. There are many, many options. Local printers frequently have great options. For a plethora of die cuts, you may want to opt for a high quality online printer or a particularly robust local printer. For creative types, this is where you can go crazy. Fun shapes, punched out elements or combinations for effects like embossing or foils, raised inks and anything else. Trick is: you’ve got to design for the die cast. There really aren’t any off the shelf templates here. Having access & skillful use of Adobe Photoshop or InDesign is essential for this type of work. In other words- Hire a professional. Preferably, Howe Innovative Design. Cool Effects: Spot UV, Foil & Embossing These are novel & cool effects. 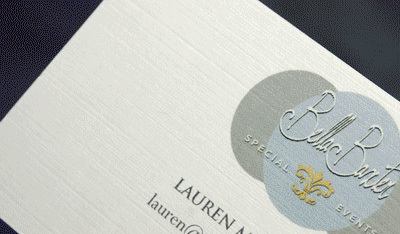 Spot UV adds a highly reflective pattern or design on matte finish cards. It’s a good choice if you want to have monochromatic colors like black on black or blue on blue. This can give a sophisticated, high design look without going crazy with sizes, die cuts or getting overwhelmed with color. You must submit this to the printer in a very specific way. Foil adds a touch of class to clear plastic or black cards. It can work well on linen cards for a classic looking logo. If you are an antiques dealer or sell boutique specialized items this is a great choice. Embossing is a time honored tradition in leather bindings. It can add texture & shape. This works for single sided, sparse designs. If you have a bold, basic logo and want a bit of texture, this works well. I don’t see many embossed cards, despite networking with room fulls of creatives on a far too regular basis. I favor using local printers whenever possible. A simple Google search will yield many results. I’ve used online printers before. It was inexpensive, I was able to design on their design interface but the turn around took almost 4 weeks, the colors where a surprise even though I was simply printing a revision of a previous card. Keep money in your economy & skilled people employed- Buy local. Corporate: The FedEx/Kinkos of the world have their place but go with a pro. Quickie corporate printers may offer instant cards but they will nickle & dime you, plus use super thin stock for instant cards. Plan on large minimum orders. If you sort of like the design, bummer, you just ordered 1000. Your better off going to office supply store & getting the pack of cards to print yourself. If you want serious business cards & can wait, they outsource them anyway. Local: Many local printers have expertise, local suppliers, run small batches & can talk you out of questionable choices. The down side: you must have files print ready with bleeds in 300 dpi. If you don’t know what I’m talking about, hire a professional to do your business cards. Did I mention Howe Innovative Design? Boutique: These are very specialized printers with cool gadgets, crazy die cut capabilities & wickedly creative minds. The prices are high but so are the design concepts. They specialize but you will look like a specialist. They can be tough to find but if you really want specialty, these are for you. 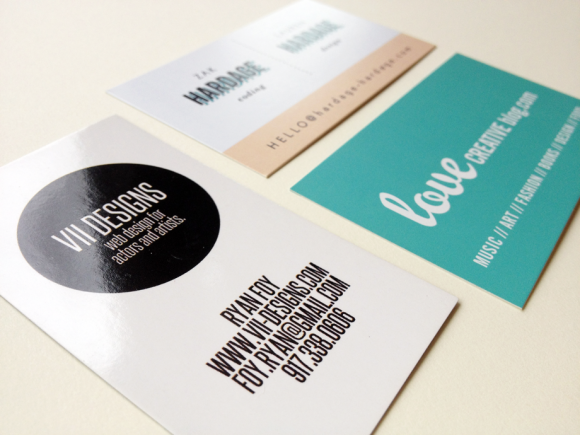 Your business cards should reflect your business identity. When growing, expanding, changing the focus of your business, offering more products or services it’s time to rebrand. No, you don’t need a new logo, although you can, your company is more than a logo. Decide on your colors first. Print local. Don’t cheap out. Hire a designer. Seriously, you’ll be glad you did.